Best Service and Eduardo Tarilonte present Kwaya African Voices, A virtual instrument featuring award-winning Ugandan choir Aba Taano. Realitone has released their Realivox Ladies' Teresa as a single Kontakt library available separately. Findasound presents Clara’s Vocal 2.0, a Kontakt vocal library with legato aimed at modern composers and sound designers. For Black Friday, Realitone announces its "lowest prices ever" on many of their products, including Realivox Ladies. Wolfgang Palm's PPG si about to release Phonem, an VST/AU advanced virtual vocalist plugin. Output has released Exhale, a vocal engine designed for use in modern music projects as well as film scores and for sound design. For Halloween, Wavesfactory offers both a free new Kontakt instrument and a 25% discount on all products. 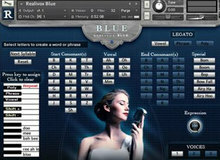 Realitone offers special prices on some of its Kontakt virtual instruments, including the Ladies series. Bela D Media has released an update for its Diva Revamp female vocal sample library for Kontakt and adds a gift to your order if you purchase it. 8Dio will launch on July 7th its biggest choir sample library for Kontakt, Lacrimosa, which will feature no less than 200 voices.